If you put Pirates of the Caribbean into a blender with Wallace and Gromit, what you’d probably get is a movie milkshake that tastes a lot like The Pirates! Band of Misfits. This is the latest offering from Aardman Animations, the production company responsible for a slew of Wallace and Gromit films, Chicken Run, Flushed Away, and a whole bunch of other really amazing stop-motion movies and shorts that are also amazingly funny. If you’ve never seen any of the Wallace and Gromit films, you should stop reading this review and go do that now, so that when I tell you this is incredibly good stop-motion animation you won’t be thinking Rudolph the Red-Nosed Reindeer or Gumby. These claymation characters are weird and wonderful and very real, with facial expressions and movement that mimic the best human performers. The humor tends to be a bit on the British side, rather cerebral as well as slapstick, with an expectation that the audience can keep up with their very steady, very funny pace. The funny business also tends to be layered, so that subsequent viewings produce additional discoveries of extra funny bits and pieces that were buried in the background before, but now become just as amusing as the main action. So, it’s important to pay attention to the props and little details because there’s a gold mine of funny gems just below the surface. Yeah, I know, now I’m mixing metaphors like a cat on a hot fudge sundae. And I have no idea what that means. 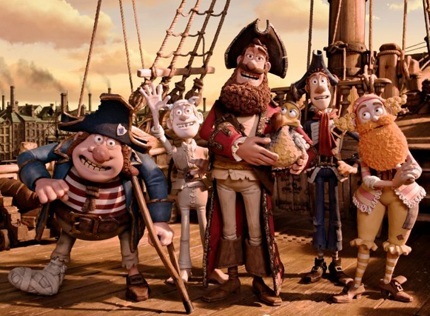 Hugh Grant provides the voice of The Pirate Captain, known to his crew and victims alike as, The Pirate Captain. Other pirate crew members include The Albino Pirate, The Pirate with a Scarf, The Pirate with Gout, The Surprisingly Curvaceous Pirate, and The Pirate Who Likes Sunsets and Kittens. They also encounter other pirates in the course of the movie, such as The Pirate King, Cutlass Liz, Peg Leg Hastings, and Black Bellamy. As the story opens, we meet Queen Victoria (Imelda Staunton), who has very little use for pirates and wants them all hunted down. The Pirate Captain is not at all worried about this because his attentions are focused on winning the coveted “Pirate of the Year” award, despite having failed for many years and suffering public humiliation in the pirate community. Determined to prove himself worthy of the award, he sets out with his faithful and feckless crew to loot and plunder every ship on the seven seas in search of booty. Sadly, they only seem capable of attacking worthless targets, ships on school field trips, plague ships, a ghost ship, and so on. Ultimately, they attack a scientific ship and meet Charles Darwin (David Tennant). Darwin becomes intrigued with The Pirate Captain’s parrot, Polly, who turns out not to be a parrot at all, but the only known living Dodo. Darwin convinces The Pirate Captain to return with him to London for a “Scientist of the Year” contest, where Polly is a shoe-in for first prize. Of course, there’s a price on the head of all pirates, although The Pirate Captain’s price is admittedly rather small, since he’s never really amounted to much, piracy-wise. Nonetheless, they all accompany Charles Darwin back to England, variously disguised as scientists and Girl Scouts, and enter Polly in the competition. Winning the contest comes with a promise of great riches, but The Pirate Captain is soon forced to choose what is most valuable to him, after all. This is not a movie that will change your life. There is no great nugget of wisdom that will be endowed upon you if you spend 88 minutes watching this instead of washing the car. There is no “aha” moment when you will suddenly see the purpose of life more clearly than you did before you started watching. But I would skip washing the car any day of the week to watch this movie. From a technical standpoint, try imagining just how complicated the animation process itself is to make so many things move in celluloid synchronicity. That alone is terribly impressive. Beyond that, however, is the fact that this movie is funny piled on top of other funny, wrapped up in more funny. In fact, do yourself the favor of watching all of the end credits and you’ll be rewarded with a great deal of the funny props and gags that were scattered throughout the movie put on display for just long enough to pick up on a bunch of jokes you missed the first time round. This is pretty safe family fare, despite the comical depictions of pirate-like violence. The language is tame, and there is plenty for everyone to laugh at. Very young viewers will find some things inherently funny, while older viewers will grasp more of the jokes and innuendo. All in all, I think there is very little here to complain about and a whole lot to just enjoy. I could be wrong, of course, but to err is human. To arrrgh! is pirate!